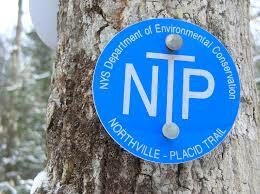 The N-P Trail began in 1922 as the first project undertaken by the newly-formed Adirondack Mountain Club (ADK). George D. Pratt, an officer of Standard Oil Company, and a wealthy benefactor, was the principal funder of the work. He was also the first president of ADK, and commissioner of the New York State Conservation Commission, a predecessor of today’s Department of Environmental Conservation (DEC). Here was a man who clearly saw the value of having a major hiking route through the heart of this great treasure known as the Adirondack Park. Why Northville to Lake Placid? It was a matter of trailhead transportation and convenience. When the trail was visualized the automobile was not yet a staple and Northville and Lake Placid had regular train service. The N-P Trail was completed in 1924. In 1927, it was donated to the State of New York, with the Conservation Department becoming responsible for its maintenance and upkeep. Today the DEC has oversight of the trail as part of the Adirondack Forest Preserve. ADK, however, along with its numerous volunteers, contributes valuable time and energy in joint cooperation with the DEC. Many ADK members adopt sections of the trail, or lean-tos along the trail, and become stewards of these domains. They organize projects in conjunction with National Trails day in early June each year. They convene to assemble prefabricated lean-tos. In addition to these volunteers, ADK, with the DEC, sponsors professional trail crews that work seasonally on improvement projects. 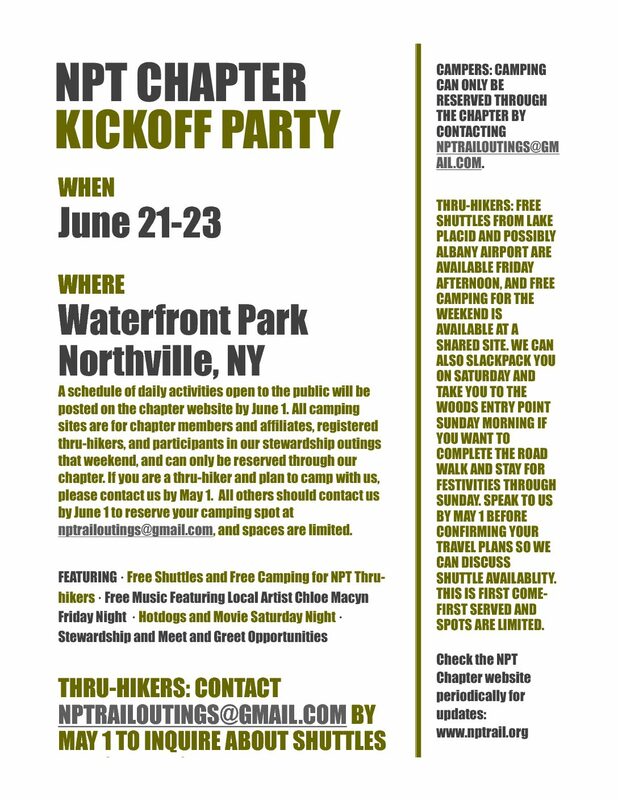 It is this cooperative, volunteer spirit that ensures the enjoyment of new generations of hikers on the N-P Trail. The trail passes through what many consider the wildest and most remote parts of the Adirondack Park, notably the high plateau that encompasses the Spruce, West Canada, and Cedar lakes area, along with that of the Cold River. The highest point the N-P Trail reaches (3008 ft) is at the crest of the ridge to the E of Blue Mt. and of Tirrell Pond. The trail is not entirely in wilderness, though: it also passes through the settlement of Piseco, and comes close to the hamlet of Blue Mountain Lake and the village of Long Lake. The area around Wakely Dam may present the hiker with encounters with recreational vehicles, not to mention a reminder of human involvement in changing the landscape in the form of the immense cement dam itself. If there is one constant along the trail, it is change. The forest is always changing. Consider trees: seeds sprout, seedlings burst onto the scene, and saplings reach for the sky. Past generations tower over everything new beneath them. Eventually they reach maturity and die, or weaken and blow over. Or are brought down when others topple around them. Then the mosses and fungi take over and it all starts again. Other forces alter the landscape along the N-P Trail. Consider the beaver,. Each new generation strikes out to look for a suitable home. Trees are felled. A dam is built. A pond is formed. The forest opens up. The sun comes through the opening in the canopy. Grass grows along the banks. Soon the scenery is changed. If all of this takes place near or even on the trail, it may have to be rerouted to accommodate these new residents. With this in mind, it comes as no surprise that sections of the trail have been moved over the years, always with a view to making the wilderness experience more enjoyable and safe.